Those of you with older television cabinets or mounted televisions know the difficulty that comes with hiding your equipment out of site while still being able to control it. Radio frequency (RF) has its benefits but requires a special remote control as well as IR blasters for each individual device you are looking to control. Sewell has developed the InjectIR device for those users who don’t want the complexity of an IR setup but still want to be able to control their hidden devices. Here are the specs according to Sewell. The Sewell InjectIR device comes in a small box with just the bare necessities. Within it lies two HDMI female to male adapters, a transmitter (TX) and a receiver (RX) cable. If you want or need a quickstart guide then a trip to Sewell’s website is required. Once you understand how the product works–and we hope this review certainly helps–its simplicity will not require it. The transmitter cable is not an IR blaster per say, in that the unit does not need to be placed directly in front of the IR location of the device. Instead–and this is how the single cable can support multiple devices–it broadcasts the signal via line of sight to any devices in range. As long as the cable find it’s line of sight (think: how a remote control works) to the device, then it should work without a problem. 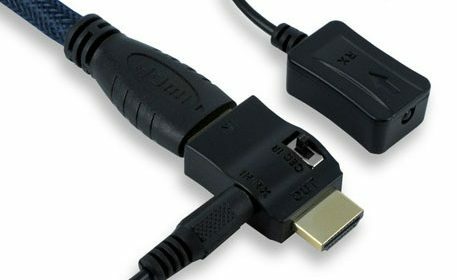 Both of the HDMI adapters are identical so connecting them is as simple as unplugging your HDMI cable and connecting them between your cable and the device. For most users interested in this device the concept is simple–your TV is in plain view of your sofa, but you want to hide your cable set top box (STB) in a closet or cabinet. In this scenario, you connect both adapters–one between your TV and the other between the HDMI cable and the STB. Then plug in the RX cable into the adapter by your TV (and point the end of the cable towards your sofa) which will receive the signal, and then the TX cable to the side with your STB. The only item to note here is to ensure that the end of the cable is pointed towards the STB or other devices. That is literally the entire setup–no drivers or configuration software is required. Use the remote control for your STB, point it to your TV (where the RX cable end is located) and use it like you would expect. All the commands work just like as if the device was out in the open. My situation was opposite of what most would (in the example above), but my television’s IR signal is located directly in the middle–convenient for most, but a terrible location if you want to place a center speaker in front of the television, thus blocking the signal. Before this review, I had to place the speaker off center; with the Sewell InjectIR I reversed the order and everything functioned just as it should. Pointing my remote control to the stereo end (where the RX side) is and the television turned on and off appropriately. And now, my center speaker can be back to its rightful spot…in the center! I also tested the Sewell Inject IR with all types of media, including HD audio formats Dolby TrueHD and DTS Master Audio and Blu-ray content, all of which performed without any interruption. There is zero noticeable lag between button presses on the remote control and when they occur on the device–an absolute requirement for this type of device. It’s not all great news however, as an FAQ on Sewell’s webpage admits that for whatever reason the device will not work with AT&T U-Verse. No details were mentioned but definitely worth noting. I find myself wanting to be able to say more about the Sewell InjectIR to complement its simplicity and effectiveness. The device does exactly was its advertised and at an affordable cost of $44.95, significantly more affordable than some other devices to achieve similar results. Unlike wireless type devices which could face interference, the IR signal is transmitted over the HDMI cable, making it for instant commands and reliable. With all the press about HDMI CEC being released and what may or may not function with it, here’s a perfect IR-based solution to an obvious need for many, myself included. As long as your device is supported (majority are) then you will be happy. If you are an unlucky AT&T U-Verse or other incompatible STB customer then you will not be so happy. Those concerned with support options can ping Sewell direct, and even if you bite the bullet there is a 30 day guarantee on it. I’ve seen some comments around the web that people just used an HDMI port saver to help with the possibility of the awkward angle/weight damaging an HDMI port. Of note I have been using one as well. It does not work 100% with xbox 360’s. It won’t turn the xbox on for same dang reason. It will turn it off and all other functions after it is on but still annoying. I don’t see why not, as long as the switch passes HDMI-CEC I would think the kit would work. The other part of your scenario with multiple STBs, I think you might be asking too much from what amounts to a simple IR extender. It’s not really a multizone solution. Any ideas how well this thing would work through an HDMI Matrix switch ? Ideally each output would be routed back to the source it was currently watching, so you could have 2 set top boxes of the same type, being watched in different rooms, and have the IR routed based on which room was watching which box..
Would also be interesting to know how it would cope with having multiple IR receivers for one sender (eg, both rooms watching the same source). We’ve had success with using the InjectIR with HDMI splitters, so that two TVs can be watching the same thing and both still have control over the source, however we have had issues with switches, (which means it also doesn’t work well with a matrix). In theory it should be possible, but we suspect that switches tend to modify the CEC channel (which is the IR signal on our case). If a switch or matrix is designed to be ‘invisible’ to the CEC signal then it should work, but I don’t know of any that are designed that way.